Breaking news, rankings, predictions and analysis all in one place. There was some notable anxiety surrounding the state of Alabama's program entering 2015. The Tide weren't coming off a terrible year by any means, as they won 12 games, won the SEC and made an appearance in the first ever Playoff. However, the Tide lost to Ole Miss earlier in the year and played a very uninspired game against Ohio State in a Sugar Bowl loss. Beginning '15, the Tide once more dropped a game to Ole Miss in which they allowed 43 points and had five turnovers, leading to more questions about whether the dominant "Saban Dynasty" was beginning its inevitable end. All Alabama did after that was dominate the college football world and win a National Title. Powerful running back Derrick Henry ran all over defenses, Alabama's defense figured it out and the quarterback situation improved as former FSU transfer Jake Coker finally settled down into the role. Those things combined to help 'Bama win their fourth title under Nick Saban, and set themselves up as heavy favorites for yet another title entering 2016. While the QB questions continue, this team certainly has the talent to dominate the SEC once more this season. Backfield: Offensive coordinator Lane Kiffin has done a wonderful job in Tuscaloosca, particularly considering he has had to break in two different quarterbacks each year. His first season, Kiffin's up-tempo, aggressive scheme worked wonders with senior Blake Sims and Alabama's offense was the most potent it had been in years. When Sims graduated heading into last year, Coker stepped up and while he had some ups-and-downs, he played wonderful football the second half of the year. The same story begins again for Alabama, as Coker has graduated. Junior Cooper Bateman, redshirt freshman Blake Barnett, sophomore David Cornwell and true freshman Jalen Hurts are all competing to take over the coveted starting job. Bateman is likely the favorite, as he started the Ole Miss game last season when the Tide were frustrated with Coker's play. He was 37 for 52 in passing attempts and added 291 yards and one score. Bateman doesn't have a huge arm, but is a solid, accurate quarterback that can move the chains, very similar to Coker. Barnett adds slightly more athleticism and a big, strong frame but lacks any experience. Cornwell has struggled with injuries in the past but also can move the ball. Then there is Hurts, certainly the wild card of the entire group. The four-star recruit out of Channelview, Texas, is very different from the other three competing for the job. He still has unrefined mechanics, but his arm strength and mobility are extremely impressive. Kiffin could certainly work some magic with all that Hurts has to offer. At the end of the day, I expect Bateman to win the job. He has the most experience and seems like a good fit in Alabama's current system. However, the other three will be in the mix and the position will be very interesting to watch all year long. Alabama also has to replace their feature back after Heisman winner Derrick Henry bolted to the NFL. The production at the position should not see much of a drop-off, as the Tide possess some absolute freaks at the position. Sophomore Bo Scarbrough is expected by many to take over and while Henry was huge, Scarbrough may be even larger, at 6'2", 230 pounds. Scarbrough is also a similar runner, a bruiser that can bust things open when he gets into open space. Behind a veteran offensive line and a system that produces 1,000-yard backs like its nothing, Scarbrough almost certainly will have a big year. Sophomore Damien Harris is also back after rushing for 157 yards and a score in a very reduced role. The smaller and quicker Harris will be a great change of pace from the power of Scarbrough. Combined, those two should make Alabama just as lethal on the ground as they were with Henry and Kenyan Drake. Receivers: There was major questions surrounding the receiver corps entering last year. The program's all-time receiving leader, Amari Cooper, had just left for the NFL and the Tide were hoping somebody else would emerge. 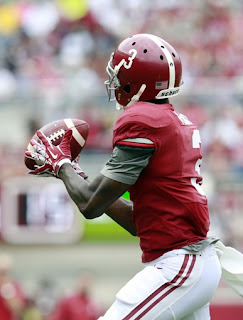 It didn't take too long for that to happen, as true freshman Calvin Ridley was wonderful right away. Ridley recorded 89 receptions for 1,045 yards and seven touchdowns, while often breaking open games. Ridley's 1,045 receiving yards smashed Amari Cooper's freshman receiving record, and he could be chasing more of Cooper's records very soon. Alabama still play plenty of smashmouth football between the tackles with Scarbrough, but having a deep threat like Ridley gives this offense so much more versatility. Junior ArDarius Stewart is also returning after putting up solid numbers in 2015. Stewart had 63 catches for 700 yards himself and proved to be extremely reliable. With defenses focusing heavily on Ridley, Stewart could see an increase in touches. The Tide are hoping for junior Robert Foster to return healthy and play a bigger role, as former Oregon State transfer Richard Mullaney departs. Foster was putting up good numbers very early on last season, with 10 catches for 116 yards before a shoulder injury lost him for the year in the Ole Miss loss. An experienced weapon with good hands, Foster should produce this season. The big newcomer to the receiver corps is not a highly touted true freshman but instead a transfer. Gehrig Dieter arrives from Bowling Green as one of the nation's top grad transfers, after he recorded 1,033 receiving yards with the Falcons last season. Dieter's numbers will almost certainly drop playing against better competition and in a not as pass-happy offense, but the veteran should still make a variety of plays and open things up underneath. Ridley, Dieter, Foster and Stewart give Alabama perhaps one of the best receiver corps in school history, and a group that Lane Kiffin should work wonders with. Helping them out should be a tight end position that will be a notable strength, thanks to the return of senior O.J. Howard. Howard was a hyped recruit when he arrived in Tuscaloosca, and his best season was probably his true freshman campaign. Many have awaited his breakout and although he has shown flashes, it really never came his sophomore year or much of his junior year. That was, until his breakthrough in the National Championship, when he had two touchdowns and was perhaps the Tide's best offensive player. Howard is 6'6", 245 pounds but has the hands and athleticism of a receiver. He should be a major threat in play action situations and in the red zone. Offensive Line: No other program in the nation reloads their offensive line quite the way Alabama does. Each year, the Tide watch plenty of dominant linemen earn high selections in the NFL Draft and then comes back even stronger the next year. This season, Alabama will be without Rimington Award winner Ryan Kelly, their center, or All-SEC tackle Dominick Jackson, but the unit could be even better. Junior Cam Robinson has had a controversial off-season but returns as one of the nation's best tackles. Robinson and 'Bama defensive back Hootie Jones were arrested this spring with felony possession of an illegal handgun and possession of narcotics. The case against them was eventually dropped with no punishment for the star left tackle, which has left many questioning how head coach Nick Saban disciplines his players. While that may hang over his head as he begins the season, there isn't any denying how great Robinson is on a football field. The gigantic tackle has started all 29 of the Tide's games the past two years, coming into the physical SEC as a true freshman and promptly dominating. 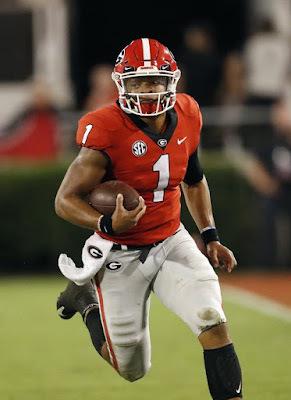 He is widely projected as a sure-fire first-round draft pick in the 2017 NFL Draft if he leaves after this season, and many even believe he could be a candidate for the No. 1 pick. While Robinson will be critical at tackle, Alabama will lean heavily on the services of Ross Pierschbacher and Alphonse Taylor inside. Pierschbacher made 15 starts last year and played extremely well. Pierschbacher should help out Alabama at either left guard, his more natural position, or the Tide could move him inside more to center to replace Kelly. Taylor is a veteran that knows how to block in the brutal SEC. Despite weighing in at 345 pounds, Taylor still finds a way to get down the field and open up lanes for 'Bama backs. Sophomore Dallas Warmack is the younger brother of former Alabama offensive linemen Chance, who dominated in Tuscloosca before he was taken tenth overall by the Titans in the 2013 NFL Draft. Dallas could earn a starting spot at either guard spot after an impressive spring. The right tackle spot, where Jackson left, is certainly a question mark. Freshman Jonah Williams has the talent to earn a starting gig, but will face plenty of competition from a wide range of blockers. That includes junior college transfer Charles Baldwin, one of the nation's premier talents from those ranks, as he arrives from Asa College in New York. Defensive Line: Under Saban, Alabama players ditching early to the NFL is no surprise. High-rated recruits show up, win a bunch of games and continue to develop and then head for millions in the pros. It is a surprise, however, when talented defenders do spurn the NFL and that just happened to be the case for defensive end Jonathan Allen. Allen likely would have a first or second round pick this past spring but instead opted to stay for his senior season and vie for another national title. Allen was a huge returnee for the Tide, as he had 12 sacks last year. At 6'3", 295 pounds Allen isn't huge but still uses his strength and quickness to get to opposing quarterbacks. While A'Shawn Robinson and Jarran Reed opted to head pro, Allen will be joined by a wonderful supporting cast, as the D-Line could end up being the strength of the defense. At nose guard, Alabama will turn to senior Dalvin Tomlinson to take over where Robinson primarily played. Tomlinson is a powerful linemen whose physicality helps him succeed. Tomlinson doesn't have the pass rushing ability of Robinson, but finds other ways to make plays, as he had 34 tackles and six pass deflections in 2015. Rounding out the starting unit should be junior Da'Shawn Hand. Hand was a well-respected five-star recruit two years ago who hasn't really seen the playing time needed to show what he can do. His lengthy, athletic frame and high motor have plenty of people excited. Hand recorded three sacks a season ago despite limited playing time and looked great in the spring. With blockers focused on Allen and the bulky Tomlinson, Hand could wreak havoc. Sophomore Da'Ron Payne is also a prime breakout candidate this year. At 6'2", 320 pounds the young defender can play inside or out, and Alabama's new defensive coordinator Jeremy Pruitt (who replaces Kirby Smart) will be creative in how he utilizes Payne. Guys like junior Josh Frazier, senior Dakota Ball and true freshman Raekwon Davis provide valuable depth to a unit that could miss some quality reserves, namely D.J. Pettway (18 tackles, two sacks in '15). Linebackers: He wasn't flashy, but nobody can deny how much middle linebacker Reggie Ragland impacted the game. The gritty veteran did it all for the Tide last season and stuffed the stat sheet full, with 102 tackles, 2.5 sacks and seven pass breakups. Unfortunately, Ragland will move on to the NFL after graduating, leaving the door open for a new star to step up at an inside linebacker spot that has produced some wonderful talent over the years. The obvious candidate has to be junior Rashaan Evans, a much quicker and athletic version of Ragland. Evans has shown plenty of potential in practice and in limited playing time, but the Tide will count on him to actually produce big numbers. He won't have as much pressure on him as he could though, as senior Rueben Foster is back after also spurning the NFL. Foster finished off second on Alabama in tackles last year, only behind Ragland, as he had 73 while adding six tackles for loss. Foster also plays similar to Ragland but relies more on his excellent closing ability than instincts. Senior Ryan Anderson is also back to give Alabama more help at inside 'backer. Anderson has a wonderful athlete and can get after the quarterback, evidenced by his six sacks last season. 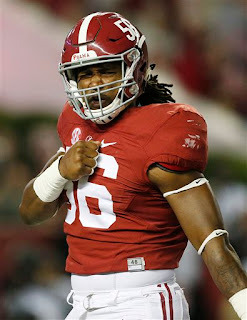 While Foster, Evans and Anderson alone give Alabama a wonderful linebacker corps, the player coaches, fans and scouts alike are most excited to see is senior outside linebacker Tim Williams. Williams played a pass-rushing specialist role last year, playing just 178 total snaps. He certainly made the most of them, recording 10.5 sacks and four quarterback hurries. After doing all that in a small role last year, the Tide are counting on Williams to not only take over a starting job, but perhaps be even better in '16. Williams has an explosive first step and powerful hands, but he will have to improve his stamina to play a much higher volume of snaps this year. The senior was absolutely unblockable in the spring, so he should be just fine. At the other outside linebacker spot, Alabama will likely to turn to junior Shaun Dion Hamilton. Hamilton has never locked down a full-time starting job (although he did have five starts last year) but has played plenty of SEC football and fits the system well. He isn't the pass rusher that Williams is, but brings impressive versatility to the table. Secondary: While Alabama and Saban produce elite prospects nearly everywhere on their football team, they do an especially good job in the secondary. Over the years, the Tide have had many shutdown corners and ball-hawking safeties pass through their ranks, and the group should be very good once more in 2016. Senior Eddie Jackson opted to stay for his final year and will play a key role. Jackson originally began his time with 'Bama as a cornerback but has switched to a strong safety role, where he appears very comfortable. Jackson's excellent range and closing speed help him pick off plenty of passes, as he recorded six last season and helped put Alabama in great position by often bringing them back for big gains. Pruitt won't change Jackson's assignments much this season; he will still be an aggressive, ball-hawking defensive back and should record plenty of interceptions. The Tide should also be very good at cornerback, despite being young there. Sophomore Minkah Fitzpatrick was very impressive last season despite his youth, and he could blossom into a superstar this season. Fitzpatrick has great size, speed and ball skills and he will only continue to grow and develop under this great Alabama staff. He'll be joined at the position by fellow sophomore Marlon Humphrey. Humphrey may not have the vast ceiling of Fitzpatrick, but he is one heck of a football player himself. Humphrey gets by with fabulous athleticism and a good feel for the game, and he proved to be quite the playmaker last year, with three interceptions. Those two may experience some growing pains early as they adjust to a starting role and a slightly different system under Pruitt, but there isn't a more talented 1-2 corner punch in the land. Free safety is the only significant question in the defensive backfield, as Geno Smith departs. Smith had 72 tackles last season and dominated the middle of the field. Sophomore Ronnie Harrison is viewed by many as the favorite to win the job, but rising redshirt freshman Deionte Thompson continues to impress. Junior Tony Brown has all the talent to be a star, as a former five-star recruit. He has impressed on special teams but is still awaiting a breakout at his cornerback position. However, Brown faced a serious suspension from the NCAA and likely will miss at least six games. His status with the team is very murky entering 2016 as he has had plenty of issues, but the talent is there for him to still be productive this season. Special Teams: Kicker has been a problem for Alabama for a long time under Nick Saban. The Tide hope they finally have stability at the position in senior Adam Griffith. Griffith has a huge leg (long of 55) but is inconsistent. Junior J.K. Scott is a great punter, but the return game will miss Kenyan Drake and former cornerback Cyrus Jones. 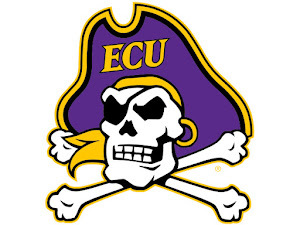 and a third straight College Football Playoff berth all are well within reach. Theme images by LUGO. Powered by Blogger.